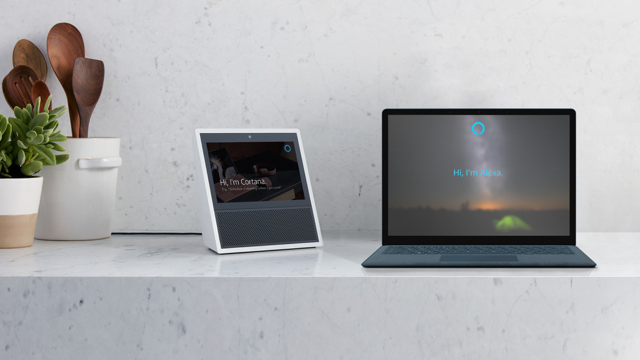 Amazon and Microsoft gave a public demonstration of the integration of Alexa and Cortana into all Echo speakers and to all Windows 10 users. That means that a user can ask Windows 10’s Cortana to open Alexa, and ask Alexa on Echo speakers to open Cortana. This integration is now available to most users but will completely roll out around the country over the next week, said a Microsoft spokesperson. Some features, such as streaming music, audiobooks and news flashes will not be available at launch. Features they both possess include reminders, timers and adding events to the user’s calendar. Microsoft chief executive Satya Nadella and Amazon chief executive Jeff Bezos first announced this partnership a year ago, and first demonstrated it at the Build developer conference in May. Cortana, which has more than 140 million monthly active users almost entirely on Windows 10 PCs, will offer Alexa on the Harman Kardon Invoke smart speakers. Amazon will offer Cortana on the Echo, Echo Dot, Echo Spot, Echo Plus, and Echo Show. Amazon hasn’t disclosed the number of Echo speakers sold, and sales of the Harman Kardon speaker has been “underwhelming and … yet to gain widespread adoption,” says VB. “We are steering the product experience toward delivering value in each of the three states that people are in, which is, in very generic terms, at work, at home, or somewhere in between — at least for our target user — and really honing in on what can [Cortana] do for that user in that setting that is assistive,” he said.